At the conclusion of the 24-hour marathon event, the team stops for one last photo. Coming off their Centennial Conference championship season and NCAA tournament Elite Eight appearance, Red Devil’s men’s lacrosse came together last week to take on a totally different kind of challenge. Hosting the 13th annual Volleyball-a-Thon, the squad enlisted help from around campus to surpass their $5,000 fundraising goal for the Red Cross, closing the portal with $6,019 raised. After taking on the men's lacrosse team on the volleyball court, the women's team takes a break. 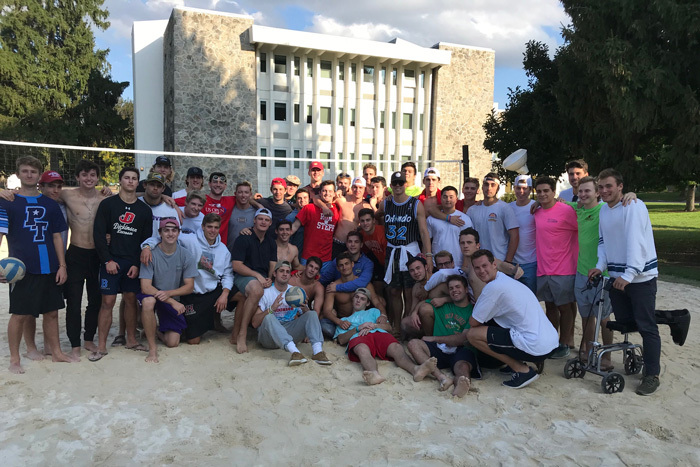 The event is a tradition that finds the sand volleyball court on the Lower Quad seeing action for 24 straight hours every fall. This year, from 5 p.m. on Sept. 28 until 5 p.m. on Sept. 29, more than 125 students participated individually and as teams, and many local restaurants contributed food for the event. Men’s lacrosse has a history of putting in extra effort for philanthropic initiatives, and 2018 has been a banner year. The Volleyball-a-Thon follows the team's 2018 victory in a national fundraising challenge put on by the HEADstrong Foundation, an organization focused on partnering with sports teams and volunteers to support those affected by cancer. In that fundraising push, the Red Devils secured $8,726 in support, the highest total of any program in the campaign and more than $5,000 above the team’s goal.